Today, we’re publishing a year-in-review with highlights from all your favorite columns. We will start showcasing new graphical features, to differentiate our columns while emphasizing their unity. The October Divine Details column will give the latest on our journey to becoming a nonprofit organization. The Young Clergy Women Project is much more than Fidelia’s Sisters. Called and Sent is devoted to the experience of young clergy women living out their vocations. Such a broad description leads to a variety of submissions. Last December, section editor Katherine Willis Pershey wrote about her experience in "homiletical petty larceny," asking herself, if accusations of plagiarism ever became serious, what are the chances that a somewhat newly ordained young woman pastor would be believed over and against a more established male pastor? When I sent out a message asking readers on Facebook for their favorite Fidelia’s articles, the shoe story, as the November article is lovingly referred to, was mentioned several times, in which I dared to suggest that something besides black flats may be appropriate in the pulpit. 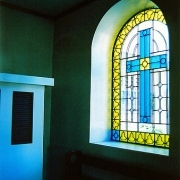 Christ and Creativity features artistic selections, such as photography, music, poetry, and pastels. Before even going through the archives, I remembered Mary Allison Cates’ Advent block print series, which powerfully juxtaposed scenes of destruction and violence with that of a pregnant woman. Divine Details publishes articles about professional issues. In March, Carol Howard Merritt discussed the fake search and the interesting, unwitting role that young clergy women sometimes play in a disingenuous call process. On the lighter side, Sarah Kinney Gaventa wrote about the young clergy woman’s ambivalent relationship with the clerical collar and about the interest a young clergy woman’s hair seems to produce. Both articles generated a lot of discussion, because, as reader Sharon Benton wrote in reference to the hair article, "It was EXACTLY what I’d experienced and felt and couldn’t put into words." However, the most commented upon article was not nearly as lighthearted. Alex Hendrickson told of her frustration with the stereotype that young clergy women can supposedly "have it all," being great full-time moms and great full-time pastors in March. Her article led to a heated discussion about motherhood and ministry. Breastfeeding, adopting, and sabbath keeping as a young clergy mom are examples of other topics the Moms and Ministry section included last year. The Gospel according to Lexi D. Vina was a short story serial column, written by a fictional American young clergy women. The particularly funny installment about liking a particular political candidate and yet choosing to hide it bears even more relevance today.This October, the new Jesus Review column will take Lexi’s place in our publication rotation. The Single Rev’s Guide to Life published articles about attractive would-be parishioners, how hard- and how public- breaking up can be, and what it’s like to be sequestered sermon writing on a Saturday night when the other single folk are out and about. More specifically, in November, Stacey Midge wrote about personal and professional challenges of the Christmas season, while the pseudonymous Phoebe Jones explores the particularities of a serious, long distance relationship in May. Sunday Morning and Beyond has given us sermons, prayers, and litanies, all written by young clergy women. Some of the articles have also been written about worship, such as Patricia Watson’s popular piece that extolled napping as part of the sermon process, reminding us all of the mystery side of homilectical preparation. The Ones We Love provides a space to consider primary relationships with family and friends. Section editor Katie Yahns picked the honest, moving article by Michelle Parsons about experience of discovering her husband had a brain tumor, including how it effected her ministry, as this year’s Ones We Love highlight. Besides an unhealthy desire to be grammatically correct, a penchant for reading, and an unremarkable stint as co-editor of my high school yearbook, I can’t say that I knew all that much about this whole "managing editor" thing. I said yes without knowing what I was saying yes to, exactly. Fortunately, it wasn’t all up to me. Thank you to the fabulous editorial board and the convener, and thank you to those of you who wrote. All of the pieces published have shaped this publication. We’re also always looking to expand the pool of young clergy women who write for this website. Visit our contact and submissions page to learn more about contributing. Lastly, thanks to all the readers. Whether this is your first time reading or you read religiously, I invite you to go back through our archives. What would you pick as last year’s highlights? Ann Bonner-Stewart is the managing editor of Fidelia’s Sisters and the associate rector of St. Paul’s Episcopal Church in Greenville, North Carolina. https://youngclergywomen.myworshiptimes31.com/wp-content/uploads/sites/3/2017/05/YCWILogo_Vert_Black-300x229.png 0 0 molly_field_james https://youngclergywomen.myworshiptimes31.com/wp-content/uploads/sites/3/2017/05/YCWILogo_Vert_Black-300x229.png molly_field_james2008-09-30 03:31:002018-11-13 11:53:34Happy Birthday, Fidelia's Sisters! Happy birthday, FS. May you have many, many more. Thank God for Fidelia and the Sisters! I would not have made it through my first year in full-time ministry without these voices letting me know that I am not alone or insane or in the wrong profession. God bless the second year!